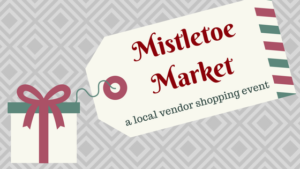 The Junior League of Hampton Roads is proud to announce it’s second annual Mistletoe Market on Sunday, November 12 at 12PM – 6PM. This year, we are excited to announce that the event will be held at Tradition’s Brewing Company in Oyster Point! At this event, you will have the opportunity to kick-off your holiday shopping with local vendors. Tradition Brewery will also have a food truck on-site and there will be seasonal beers on tap in the tasting room for purchase. There will also be live country music from 12PM to 4PM, a seasonal bake sale, and several fabulous raffle prizes! Admission to this shopping event is absolutely free and open to the public. All proceeds from the event will benefit the Junior League of Hampton Roads. Join us on our Facebook event page for exciting announcements! In the event of inclement weather, the event will be rescheduled for Sunday, November 19. If you are a vendor interested in selling at this event, please contact Valia Maloney at vmaloney@jlhamptonroads.org.